Ann Colone was a Fort Wayne television and media personality who is probably best remembered as the host of “The Ann Colone Show,” which started in 1958 and ran for 18 seasons on WANE TV (channel 15). In addition to her television work, Colone (who died in 2007) was also active and local theater and was WGL’s first female disc jockey. “The Ann Colone Show” ran 5 days a week and featured exclusive interviews with many national celebrities and political figures of the day. This photo, from the November 12, 1964 episode, shows Colone interviewing what we’re guessing are the members of some rock band. Not sure who they were, but they’re too shaggy to be locals. In fact, they look a little foreign. 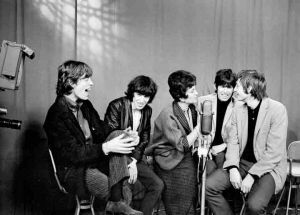 Several times in these pages we’ve mentioned photos we’ve seen of The Rolling Stones appearing on the Ann Colone show back in 1964. Justin Johnson, Gallery Director at the University of St Francis, saw one of those stories and put us in touch with local photo legend Stephen Perfect, who took those shots (and many, many others) during his long career. The event happened in November 1964, and Johnson tells us that the University St Francis plans to showcase highlights from Stephen’s photos of the event during an exhibit later this year. Our thanks to Justin Johnson for putting us in touch with Stephen. And of course, our extra special gratitude to Stephen Perfect for generously granting us permission to run the photo. Awesomest Old School Pic EVER! 40 people	reviwed this story with an average rating of 4.9.